Charlotte’s Wretched have been melting face since 2005, but with their 2014 release Cannibal they return to the core of melodic death metal and the roots of the genre that are eternal. The string work on this album is part of what sets it apart from so many others. Wretched has managed to revolve their sound on this album around the technical and the attention to detail is impressive. Not a single run is wasted, no trills and never-ending loops, just precise unrelenting instrumental ruin. Songs like “Calloused” and “Cranial Infestation” demonstrate the dexterity with which the band can perform and diversify. The switching of the melodies and incorporation of the heavier percussion with jagged sonic stitching are what make this album a feast for the ears. Then there’s “Salt Lick” and the magnum opus, “Cannibal” that jumpstart the second half of the album. 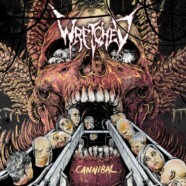 “Cannibal” especially highlights Wretched’s commitment to diversity because it is seven and half minutes of pure instrumental deconstruction and exemplary musical craftsmanship. Not a word spoken, but a message that rings clear: without skill and passion, it’s all just noise. Where so many others fall victim to the lazy cacophony approach to death metal, these guys seem to take an artful approach instead. Even vocally, front man Adam Cody does fall prey to the usual “-core” pitfalls. In every track his vocals, albeit occasionally distorted, usually ring out with distinction and intent, instead of crumbling or melting into the incomprehensible. Ending on “Engulfed in “Lethargy,” Wretched take listeners on the final dark and twisted path to their conclusion. Opening in an eerie ambiance before rolling into a quicker tempo and ferocious vocals, this song carries an almost funerary undertone throughout its progression. While the top layer of sound is a quick fretted, pounding drum fueled journey that feels expedited, the underlying sound is darker with more gothic tones. It’s this dichotomy of sound that creates an attractive grit to the track and summarizes Cannibal in the best way.